Nancy June Wood dedicates “Arise, Shine!” to awareness of mental illness. Dr. Wood has a severe hearing loss and experienced mental illness during a difficult period in her life. Her art embodies the theme “Inclusion Drives Innovation” for 2017’s National Disability Employment Awareness Month. The title, National Disability Employment Awareness Month October 2017 appears across the top of the poster in dark blue and gold lettering. The left side of the poster features the artwork, a woman who is sitting on a surface reflecting clouds of many colors. She is wearing a dress and her right arm is extended. The background reflects the sun and clouds in shades of gold, purple and pink. 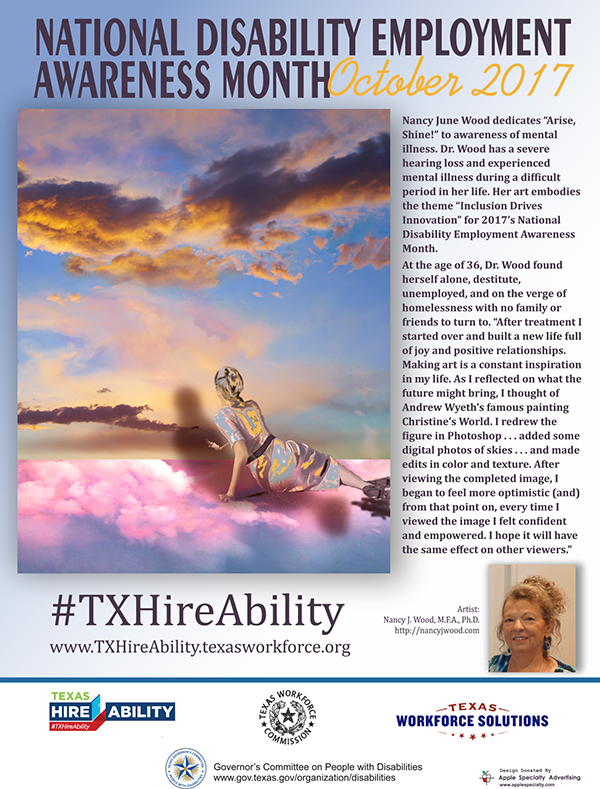 Below the artwork reads #TXHireAbility and website: www.TxHireAbility.texasworkforce.org. There is a photo of Dr. Wood as well as her website: http://nancyjwood.com. At the bottom of the poster are five sponsor logos: Texas Governor’s Committee on People with Disabilities, Texas Hire Ability, Texas Workforce Commission, Texas Workforce Solutions, and Apple Specialty Advertising. Ms. Denise Tidwell has loved art since early childhood. She has memories of sketching, designing doll clothes and decorating gingerbread cookies with her mother, who recognized and encouraged Denise’s creativity. After thirty years of teaching special education and deaf education to children, Denise chose to pursue her second career as an artist. Today she fancies painting acrylic portraits of family pets. Denise works as Events Coordinator for the Deaf and Hard of Hearing Center in Corpus Christi and loves teaching children. 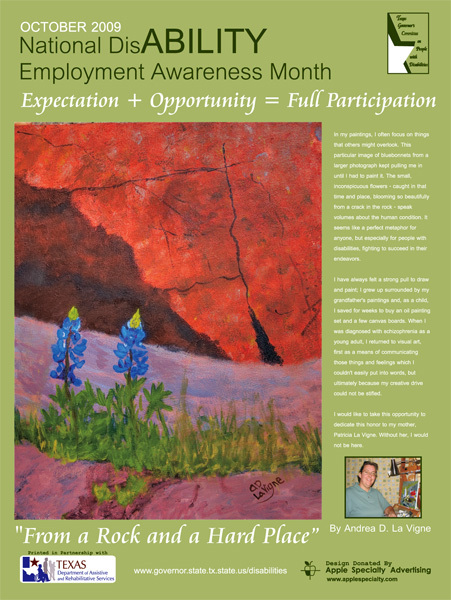 At the top of the poster, just above the artist's painting, the text reads October 2016 National Disability Employment Awareness Month in white lettering and just below is the theme, #InclusionWorks in yellow lettering. The left side of the poster includes the artist's artwork, a beautiful young girl with multi-colored butterflies in her hair. The girl’s hands are interlocked with fingers extended and shaping the ford butterfly in ASL. The main background color is navy blue. Photo of the artist, Denise Tidwell is placed next to the text. For logos are posted at the bottom: Texas Governor’s Committee on People with Disabilities, Apple Specialty Advertising, Texas Workforce Commission and Texas Health and Human Services Commission. Website addresses are included. My name is Astrid Wienken. I was diagnosed with Multiple Sclerosis in 2003. Two years ago, I collapsed. I was paralyzed; I couldn’t walk or move my right arm or hand. An MRI showed various lesions, some as big as tumors. I still experience body and muscle fatigue every day. My right hand and leg are still weak and in pain, and my memory is not as sharp as it was, but the option of giving up didn’t exist then and never will. I’ve always seen myself as a strong and independent woman. Since I could no longer use my right hand, I focused on teaching my left hand to paint. Being able to pursue my artistic passion after all that I went through – and continue to go through – is to me the greatest gift of all. Painting is my therapy, my outlet, my inner savior, and I want to share it with others. With MS, it is a common thing to feel isolated; being able to share my art with others diminishes that feeling. I love horses, as they stand for freedom, power and strength. Being able to express myself through paintings is my savior. I even heard family and friends say that they actually love my left-handed paintings better than anything I had ever done with my right hand. In that statement alone, to me, comes peace and happiness. Always Believe in Yourself, Stand Tall and You Will Prevail. Three logos are posted at the bottom: The Governor's Committee on People with Disabilities, Apple Specialty Advertising, and the Texas Department of Assistive and Rehabilitative Services. Website addresses are included. 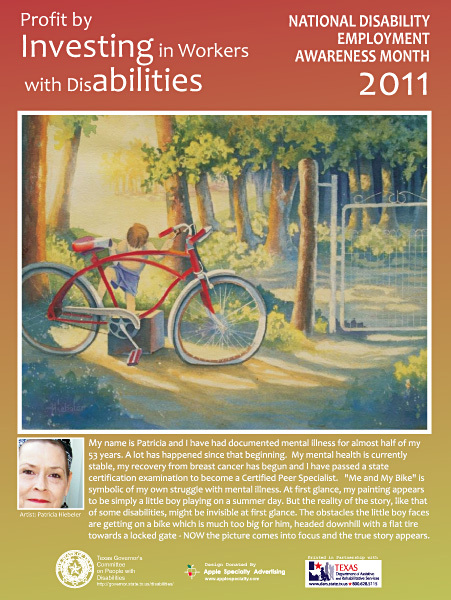 At the top of the poster, just above the artist's painting, the text says National Disability Employment Awareness Month 2015 in white lettering on a blue background. Just below is the artist's artwork, a beautiful blonde horse with a white mane blowing in the wind, running and turning to the left as if to leap outside the frame. Behind the horse are deep green trees and sprinkles of yellow wildflowers. 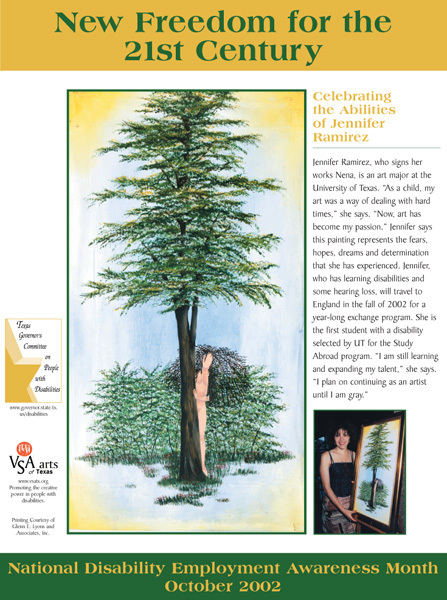 Below the artwork is the 2015 NDEAM theme in yellow lettering: “My disability is one part of who I am;” below that is the Artist’s Statement next to a headshot photo of the artist, Astrid Wienken. 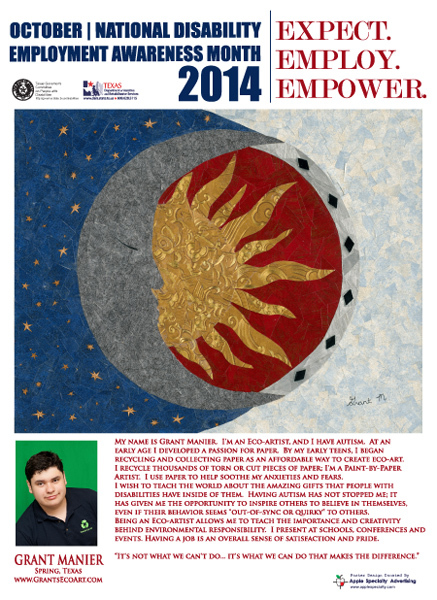 At the top of the poster, just above the artist's painting, the text says October: National Disability Employment Awareness Month 2014 in blue lettering on a white background, and small logos for the Governor's Committee on People with Disabilities and the Department of Assistive and Rehabilitative Services. To the side of that is the NDEAM theme in red lettering: "Expect. Employ. Empower." Just below is the artist's artwork, composed of tiny pieces of various colored paper glued to the canvas to create the image of a dark blue sky with stars on the left; then a dark gray crescent moon with one closed eye; then a bright gold sun streaming out into a red background; and on the right side a light blue sky. A photo of the artist, Grant Manier, is next to his Artist's Statement. At the bottom of the poster is the logo for Apple Specialty Advertising. My name is Grant Manier. I'm an Eco-artist, and I have autism. At an early age I developed a passion for paper. By my early teens, I began recycling and collecting paper as an affordable way to create eco-art. I recycle thousands of torn or cut pieces of paper; I'm a Paint-by-Paper Artist. I use paper to help soothe my anxieties and fears. I wish to teach the world about the amazing gifts that people with disabilities have inside of them. Having autism has not stopped me; it has given me the opportunity to inspire others to believe in themselves, even if their behavior seems "out-of-sync or quirky" to others. Being an Eco-artist allows me to teach the importance and creativity behind environmental responsibility. I present at schools, conferences and events. Having a job is an overall sense of satisfaction and pride. "It's not what we can't do......It's what we can do that makes the difference." Three poster credits are included: The Governor's Committee on People with Disabilities, Apple Specialty Advertising, and the Texas Department of Assistive and Rehabilitative Services. Logos and website addresses are included. 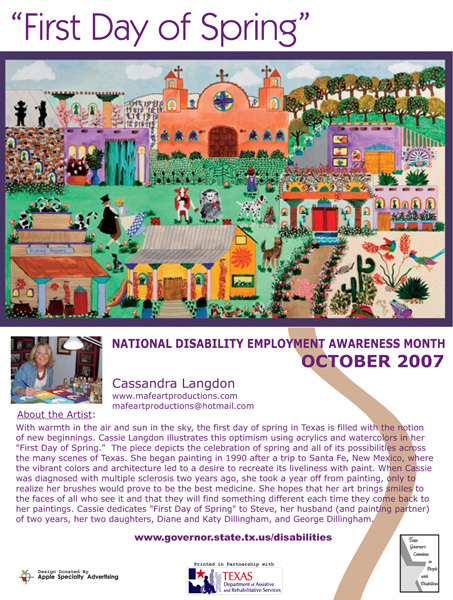 At the top of the poster, just above the artist's painting, the text says National Disability Employment Awareness Month 2013 in white lettering on a dark blue background. Just below is the artist's painting of a cowboy sitting atop his horse, glancing toward a vivid, brightly colored sunset across dark hills. 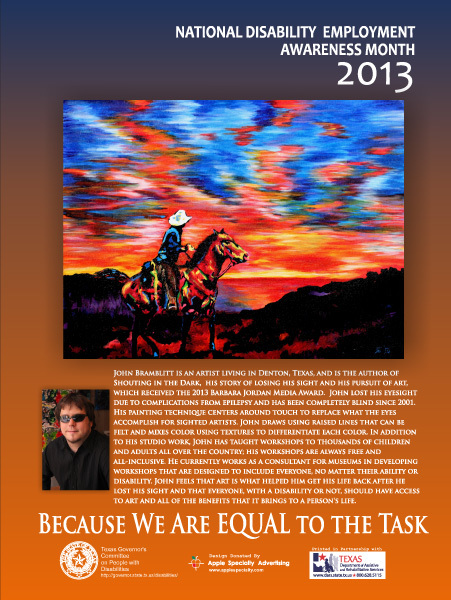 Vivid red, orange, blue, and yellow dominate the sunset; the colors are incorporated into the horse and cowboy image. The dark blue background of the poster fades gradually into a deep orange near the bottom of the poster. A photo of the artist, John Bramblitt, is next to his Artist's Statement. Below the photo and statement is the national theme: Because We Are Equal to the Task. At the bottom of the poster are the logos for the Governor's Committee on People with Disabilities, Apple Specialty Advertising, and the Department of Assistive and Rehabilitative Services. John Bramblitt is an artist living in Denton, Texas, and is the author of Shouting in the Dark, his story of losing his sight and his pursuit of art, which received the 2013 Barbara Jordan Media Award. John lost his eyesight due to complications from epilepsy and has been completely blind since 2001. His painting technique centers around touch to replace what the eyes accomplish for sighted artists. John draws using raised lines that can be felt and mixes color using textures to differentiate each color. In addition to his studio work, John has taught workshops to thousands of children and adults all over the country; his workshops are always free and all-inclusive. He currently works as a consultant for museums in developing workshops that are designed to include everyone, no matter their ability or disability. John feels that art is what helped him get his life back after he lost his sight and that everyone, with a disability or not, should have access to art and all of the benefits that it brings to a person's life. The 2012 NDEAM theme, "A Strong Workforce Is an Inclusive Workforce: What Can YOU Do? ", is in dark green and pink lettering along the top of the poster. At the bottom of the poster, the text says National Disability Employment Awareness Month, October 2012. Below the title is the featured colored pencil drawing of five pink flamingos standing in shallow water near the edge of a pond, with trees and grass along the shore. The flamingos are in various positions, some looking up, some with their heads down near the water. Beverly Fuqua hopes to continue creating and teaching art until she can no longer hold a pencil, pastel or brush. Ms. Fuqua has a rare genetic disorder, Osteogenesis Imperfecta, which led to her having to use a wheelchair by the late 1990s. Still, she looked upon this as a blessing from God - a development in her life that would allow her more opportunity to focus on her art. She made time to use her talent to teach fine art to children with disabilities, helping them to build self-esteem and confidence through their own artwork. She continues to teach summer workshops, to help raise funds for service animals, and to raise public awareness of mobility issues, accessible parking, and, with her partner Otis, make people aware of the role of service animals in providing independence, safety and confidence in their partners. Ms. Fuqua has a particular passion for painting animals and sees deeply metaphorical messages in their poses. 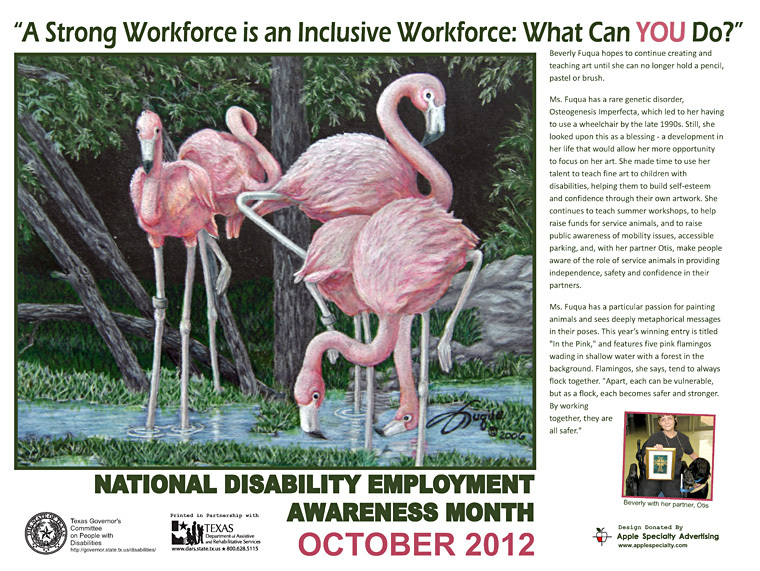 This image, which won the 2012 NDEAM Poster Art Competition, is titled In the Pink and features five pink flamingos wading in shallow water with a forest in the background. Flamingos, she says, tend to always flock together. "Apart, each can be vulnerable, but as a flock, each becomes safer and stronger. By working together, they are all safer." The background of the poster is white with dark green and pink lettering. Total poster size is 18 inches by 24 inches. The 2011 NDEAM theme, Profit by Investing in Workers with Disabilities, is visible at the top left. 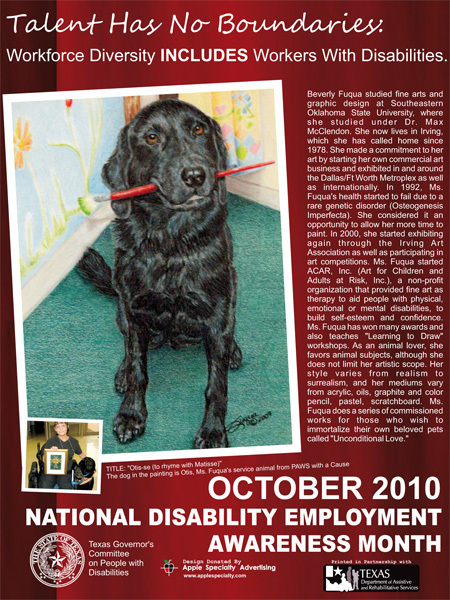 At the top right the text says National Disability Employment Awareness Month 2011. Below the title is the featured watercolor painting of a little boy standing on a box, trying to get up on a red bicycle that is much too large for him. The bicycle has a flat front tire and is facing a downhill ride towards a locked gate. Sunlight shines through the tall trees in the woods around him, casting shadows on the ground. Below the artwork is an up-close headshot photo of the artist, Patricia Hiebeler, with her Artist's Statement to the right side of the photo: "My name is Patricia and I have had documented mental illness for almost half of my 53 years. A lot has happened since that beginning. My mental health is currently stable, my recovery from breast cancer has begun and I have passed a state certification examination to become a Certified Peer Specialist. "Me and My Bike" is symbolic of my own struggle with mental illness. At first glance, my painting appears to be simply a little boy playing on a summer day. But the reality of the story, like that of some disabilities, might be invisible at first glance. The obstacles the little boy faces are getting on a bike which is much too big for him, headed down hill with a flat tire towards a locked gate - NOW the picture comes into focus and the true story appears." The background of the poster fades from a dark rust color at the top to a light green at the bottom. Total poster size is 18 inches by 24 inches. Total poster size - 18 inches by 24 inches. Below the title, at a slight tilt to the left, is the artwork, a detailed colored pencil drawing of the artist's service dog, Otis, a black lab, sitting down and looking atthe viewer. Otis is holding a red paintbrush with a tip of green paint sideways in his mouth. Behind Otis is a corner of a painted wall and curtain with various pastel colors and flowers. Just below the artwork is the title of the piece - "Otis-se(to rhyme with Matisse)" - and the statement "The dog in the picture is Otis, Ms. Fuqua's service animal from PAWS with a Cause." Fuqua, in her wheelchair with Otis at her side. 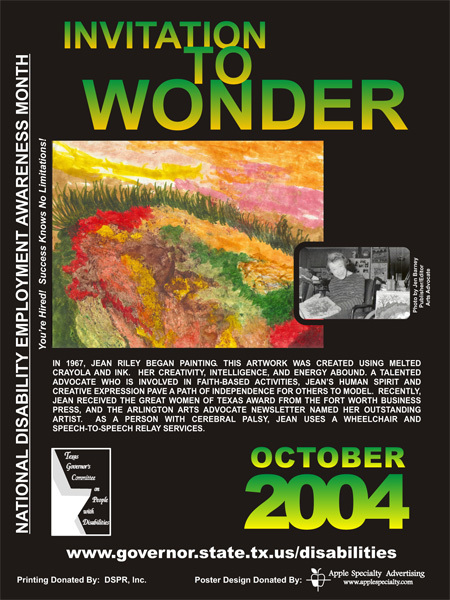 At the bottom of the poster, large white letters say October 2010 National Disability Employment Awareness Month. Below that is the State Seal of Texas with "Governor's Committee on People with Disabilities," the logo of Apple Specialty, the company that provided the poster design, and the logo for the Texas Department of Assistive and Rehabilitative Services, which printed copies of the poster for distribution. This is a close-up view of a rocky limestone cliff, with solid rock base and a cracked rock wall rising from it. The light and shadows show the rocky surfaces as various shades of violet, blue, dark orange, and red, with tiny bits of gray and beige. A crack in the base is filled with a few sprigs of green grass and two blooming bluebonnets. The flowers, just to the left of center of the picture, are vivid blue with light green tips. In my paintings, I often focus on things that others might overlook. This particular image of bluebonnets from a larger photograph kept pulling me in until I had to paint it. The small, inconspicuous flowers - caught in that time and place, blooming so beautifully from a crack in the rock - speak volumes about the human condition. It seems like a perfect metaphor for anyone, but especially for people with disabilities, fighting to succeed in their endeavors. I have always felt a strong pull to draw and paint; I grew up surrounded by my grandfather's paintings and, as a child, I saved for weeks to buy an oil painting set and a few canvas boards. When I was diagnosed with schizophrenia as a young adult, I returned to visual art, first as a means of communicating those things and feelings which I couldn't easily put into words, but ultimately because my creative drive could not be stifled. I would like to take this opportunity to dedicate this honor to my mother, Patricia La Vigne. The background of this poster is sandy western tan. 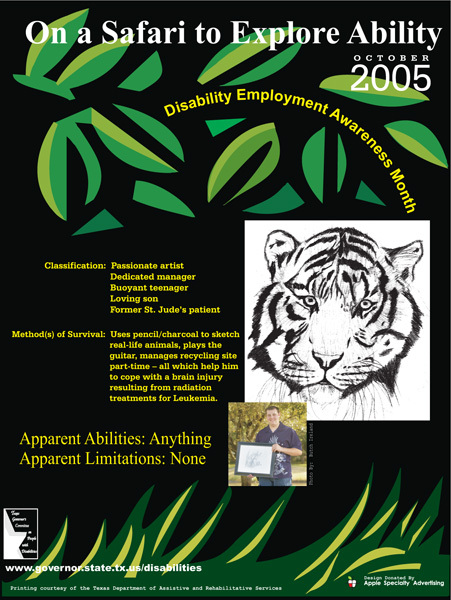 The words National Disability Employment Awareness Month 2008 flow across the top of the poster. Underneath and to the right is the national slogan, America's People; America's Talent; America's Strength! Over the course of my life, I have had many wonderful opportunities to observe and gain understanding of how people respond when faced with challenges. These experiences and insights provide me with the desire and passion to be a visual artist. For a person with a hearing loss, visual communication is the strongest means of survival. A person's facial expression, gestures, body language and their unique movements are the highlights of visual communication. Visual art is a universal language that communicates without the need to hear or understand spoken words. I enjoy the freedom of allowing the art making process to transform creatively. I am interested in conveying a sense of freedom, self-worth, values, boldness, and pride. Exquisitely and delicately, I enjoy the idea of allowing my work to reflect the true beauty and sensitivity of the human spirit. To the left is a large representation of the artwork. You see two cowboys on horseback from the back. They are facing the bleachers dotted with spectators. They are rodeo competitors and we see their competition numbers 325 and 324 on their backs. Both have black hats on and lassos at the ready. Cowboy number 325 wears a red shirt with jeans and rider number 324 wears a purple shirt with jeans. They appear to be ready for the gate to swing open and the competition to begin. The chestnut horses are alert and ready. The seats in the bleachers are separated into sections. The seats in the section to the right are aqua blue. There are a few people seated here and there. The seats in the section to the left are burnt orange. There is a small group of people in that section. Printed in Partnership with: The Texas Department of Assistive and Rehabilitative Services. The background of the poster is white with a bold purple frame around the artwork and a sandy tan curving line that runs from a pathway that is part of the artwork down to the bottom of the poster. Across the top of the poster, letters in purple read "First Day of Spring." The artwork takes up the top half of the poster. Below the artwork, purple letters read "National Disability Employment Awareness Month, October 2007." Just below the artwork to the left is a color photo of the artist, Cassandra Langdon, with her website address, www.mafeartproductions.com, and her email, mafeartproductions@hotmail.com. The artwork depicts a vibrantly multi-colored scene of a small village, with an Alamo-type mission, a small store that has a sign that reads "Pickled Peppers," and a few other small wooden and stucco buildings that look like residences. Trees, flowers, vines and cacti are blooming all around. Near the mission is a stone wall with two men standing on top playing drums and a horn. On the lawn around the mission and the buildings are several dogs and cats, a cow in a tuxedo standing upright and holding hands with a sheep, several multi-colored frogs, turtles, birds, and flamingos. Near the mission is a gardener on his knees, and on the lawn a man in a top hat and coat dances with a woman in a long skirt. A sandy tan pathway runs from a gateway near the mission to the foreground of the picture, and the pathway curves from the edge of the artwork all the way down to the bottom of the poster. With warmth in the air and sun in the sky, the first day of spring in Texas is filled with the notion of new beginnings. Cassie Langdon illustrates this optimism using acrylics and watercolors in her "First Day of Spring." The piece depicts the celebration of spring and all of its possibilities across the many scenes of Texas. She began painting in 1990 after a trip to Santa Fe, New Mexico, where the vibrant colors and architecture led to a desire to recreate its liveliness with paint. When Cassie was diagnosed with multiple sclerosis two years ago, she took a year off from painting, only to realize her brushes would prove to be the best medicine. She hopes that her art brings smiles to the faces of all who see it and that they will find something different each time they come back to her paintings. Cassie dedicates "First Day of Spring" to Steve, her husband (and painting partner) of two years, her two daughters, Diane and Katy Dillingham, and George Dillingham. The background of the poster is a deep sky blue. 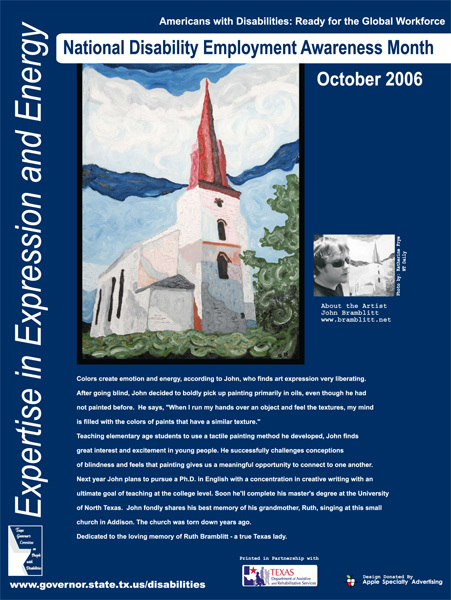 Across the top of the poster, letters in white read "Americans with Disabilities: Ready for the Global Workforce," and along the left side of the poster, white letters read "Expertise in Expression and Energy." Top center is the artwork and a black-and-white photo of the artist, John Bramblitt, standing in front of the artwork. The caption underneath the photo provides a link to John Bramblitt's website: www.bramblitt.net. A small white church with a tall reddish steeple sits surrounded by curls of green on the ground and along the right side. Behind and above the church is a sky with layers of dark blue, light blue, and white clouds. The church has a narrow entrance with two small windows, one on each of the two floors beneath the steeple. Along the side of the church are three tall narrow windows. Colors create emotion and energy, according to John, who finds art expression very liberating. After going blind, John decided to boldly pick up painting primarily in oils, even though he had not painted before. He says, "When I run my hands over an object and feel the textures, my mind is filled with the colors of paints that have a similar texture." Teaching elementary age students to use a tactile painting method he developed, John finds great interest and excitement in young people. He successfully challenges conceptions of blindness and feels that painting gives us a meaningful opportunity to connect to one another. Next year John plans to pursue a Ph.D. in English with a concentration in creative writing with an ultimate goal of teaching at the college level. Soon he'll complete his master's degree at the University of North Texas. John fondly shares his best memory of his grandmother, Ruth, singing at this small church in Addison. The church was torn down years ago. The art is dedicated to the loving memory of Ruth Bramblitt - a true Texas lady. Uses pencil/charcoal to sketch real-life animals, plays the guitar, manages recycling site part-time all which help him to cope with a brain injury resulting from radiation treatments for Leukemia. Printing in partnership with: The Texas Department of Assistive and Rehabilitative Services. This poster has a black background, along the left side, printed lengthwise is: National Disability Employment Awareness Month. Under this are the words "You're Hired! Success knows no limitations! To the right of these words is Jeans artwork, an abstract landscape done in green, yellow, pink, orange and brown. Next to the artwork, is a picture of Jean holding her painting. Printing Donated by: DSPR, Inc. 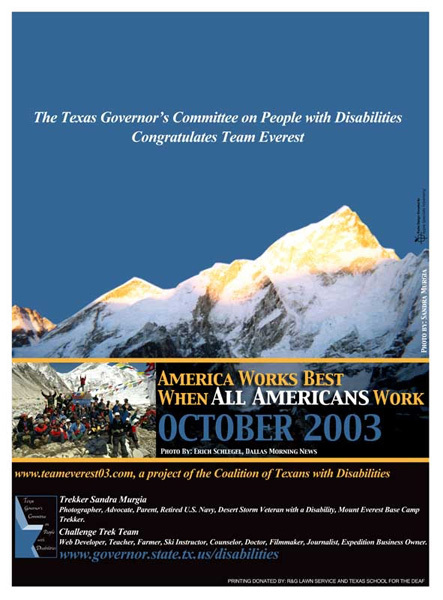 The Texas Governors Committee on People with Disabilities congratulates Team Everest. Below the picture of the peak of Everest is a group photo shot of Team Everest, to the right of the group photo are the words: America Works Best When All Americans Work. Below the picture is www.teameverest03.com, a project of the Coalition of Texans with Disabilities. Treker Sandra Murgia: Photographer, Advocate, Parent, Retired U.S . Navy, Desert Storm Veteran with a disability, Mount Everest Base Camp Trekker. The background of this poster is white. Jennifer's painting is of a large tree. There is a figure of a female partially hidden behind the tree. Behind the woman in the background are more plants. This painting is tall and takes up most of the height of the poster. that she has experienced. Jennifer, who has learning disabilities and some hearing loss, will travel to England in the fall of 2002 for a year-long exchange program. She is the first student with a disability selected by UT for the Study Abroad program. "I am still learning and expanding my talent," she says. "I plan on continuing as an artist until I am gray." Presented by: The Texas Governors Committee on People with Disabilities and VSA, www.vsatx.org, Promoting the creative power in people with disabilities. 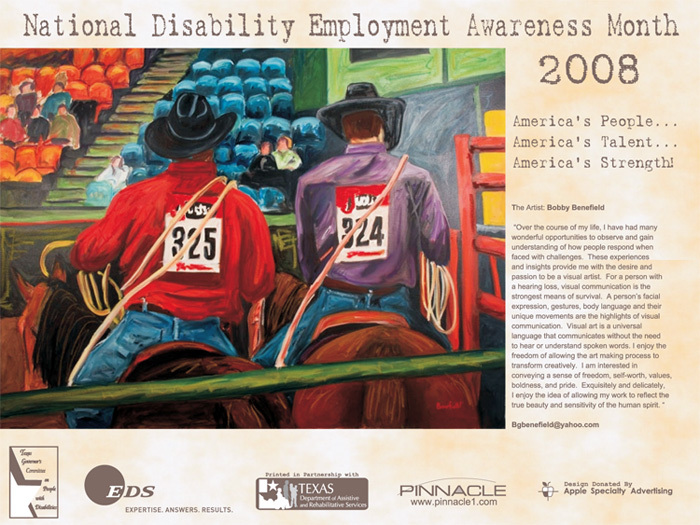 Printing Courtesy of Glenn E. Lyons and Associates, Inc.
At the top of this poster are the words: National Disability Employment Awareness Month. Underneath are the words: Win with Ability. Suzanne's painting of a large almost black oxford type shoe is painted on a dark reddish brown background. The painting is centered on the poster. 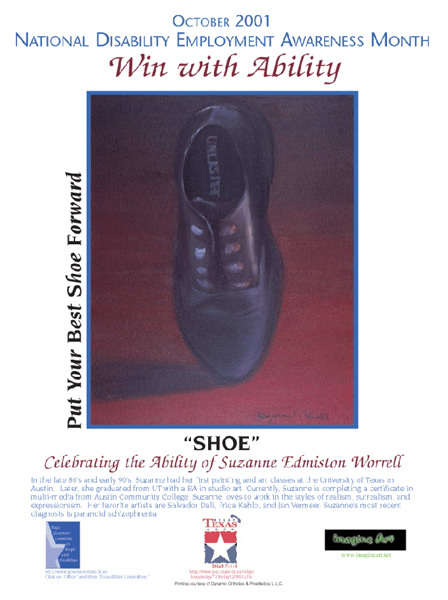 Along the left side of the painting the poster has the words, "Put your best shoe forward". In the late 80's and early 90's, Suzanne had her first painting and art classes at the University of Texas in Austin. Later, she graduated from UT with a BA in studio art. Currently, Suzanne is completing a certificate in multi-media from Austin Community College. Suzanne loves to work in the styles of realism, surrealism, and expressionism. Her favorite artists are Salvador Dalí, Frida Kahlo, and Jan Vermeer. Suzanne's most recent diagnosis is paranoid schizophrenia. 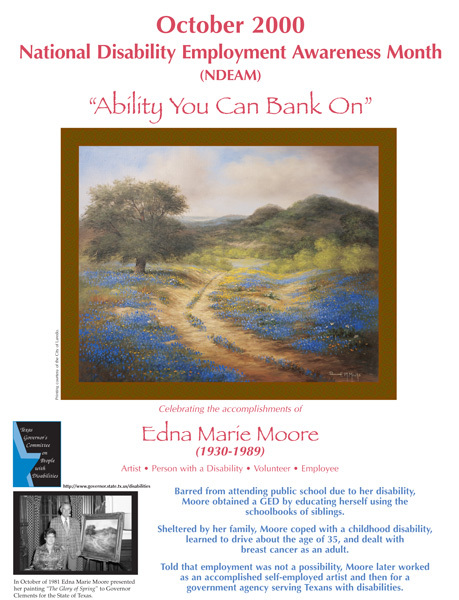 Edna's painting is a Texas landscape of rolling hills, a large oak tree and bluebonnets. There is a rutted dirt road in the center of the painting leading off into the hills. The bluebonnets are abundant along the sides of the road and remain in the center of the rutted road. A large oak tree is to the left of the road. Barred from attending public school due to her disability, Moore obtained a GED by educating herself using the schoolbooks of siblings. Sheltered by her family, Moore coped with a childhood disability, learned to drive about the age of 35, and dealt with breast cancer as an adult. Told that employment was not a possibility, Moore later worked as an accomplished self-employed artist and then for a government agency serving Texans with disabilities. A small picture of Edna is to the left of her biography. In the picture, Edna is presenting this painting in October 1981 to Governor Clements as a gift for the State of Texas.